A by-product of having boys are holes in the knees of jeans. What to do with all the denim? Donate? 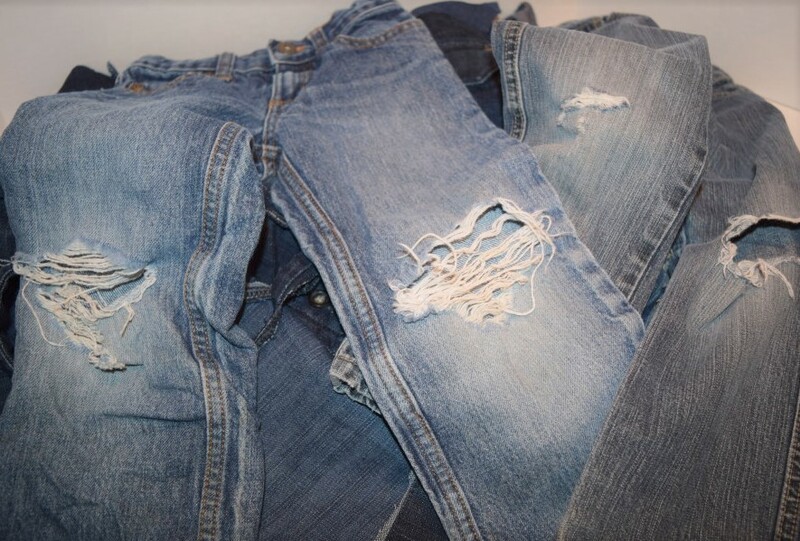 Nobody wants old jeans with air conditioning! Repurpose? Sure, but what? 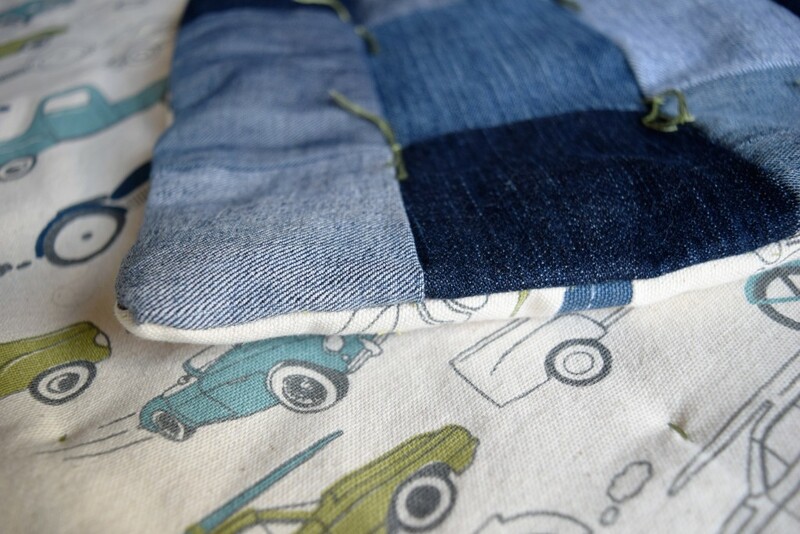 A friend once made a quilt out of old jeans. 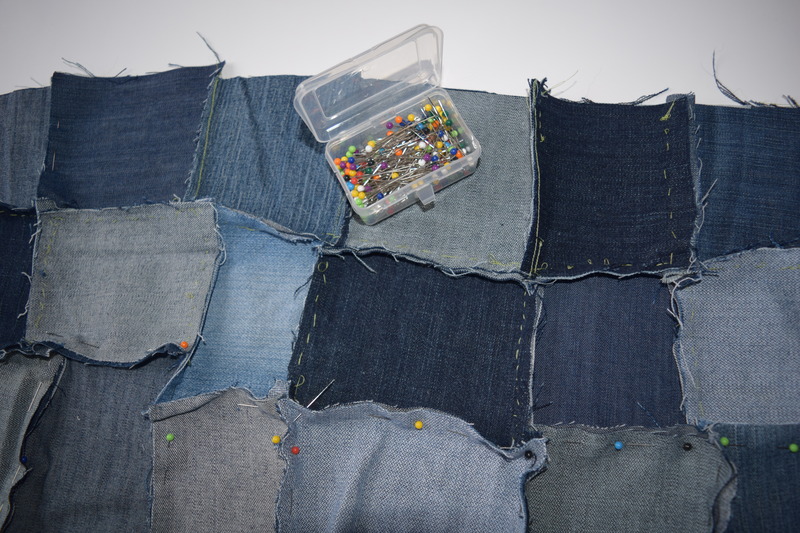 I thought, “I can do that!” Once I’d gathered up the large pile of holey jeans I realized that there was a large array of colors to work with – especially if I turned some over to show the inside. And that my kids are tough on clothes! At first I started pinning squares together and then hand stitching them together. I hadn’t cut all the pieces EXACTLY the same size – so putting them together was a bit like Tetris. If you do this project, make sure you cut all the pieces the same size. Since kids’ pant legs are much smaller than yours – pick a size and stick with it! And I suggest maybe a bit on the bigger side so you don’t lose a lot after stitched together. To be honest, I gave up on this project until my own mom came to visit for Christmas. I showed her my mess and she kindly took it home to finish it on her own sewing machine. (Bless her!) We found this adorable fabric for the backing. Isn’t it cute and perfect for a little boy? I found it at Hobby Lobby. To see my denim purse made from the remnants of this project, click here. Mom reiterated the need for squares to be the same size. 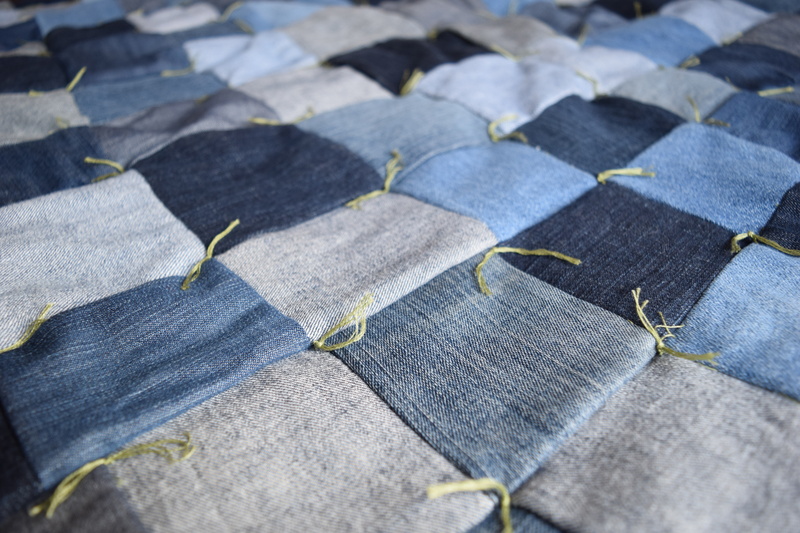 Since I didn’t give her enough denim to make more squares the finished quilt turned out smaller than I’d anticipated. (Somewhere between twin and crib sized.) I wouldn’t call this a “Pinterest Fail” exactly but it wasn’t what I’d had in mind. 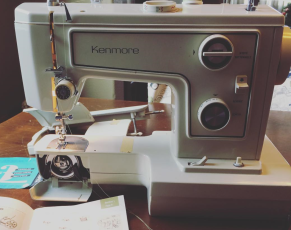 So, if you plan to do this project make sure you have a sewing machine handy…and that you can actually use it! And cut your denim squares the same size!